This morning I enjoyed the company of Larry and Nita. They are a wonderful Oklahoma couple who celebrated their 40th wedding anniversary with us. (And I thought Scott and I were doing a great job making it to 20!!) It is couples like this that inspire me. Being married isn’t easy and it isn’t always fun but it is worth all the work when you find yourselves 40 years down the road happy, content and spending quality time together. I hope they had a great stay and I, very much, enjoyed cooking breakfast for them. 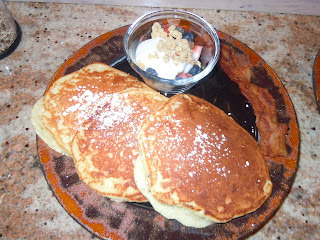 Speaking of….We had pecan pancakes (always toast your pecans in the oven before putting them in the batter, and don’t put them in the batter until you put the cakes on the griddle) with warm griffins(made in Oklahoma)syrup and melted butter…mmmm add to that 3 strips of lean bacon and some fresh strawberries and blueberries with vanilla yogurt and granola and you have a nice start to year number 41!! I just want to wish Larry Nita many more happy years of wedded bliss!! !